China Crash, Greece Collapse, Harbingers of Stock Market Apocalypse Forecast 2015? Whilst all eyes in the West were on Greece as its marxist Syriza government played game of thrones with the Greek peoples lives as they black mailed the Eurozone, the chinese stock market crashed, collapsing by over $2 trillion into a BEAR MARKET sending over 200 million chinese retail investors into a panic as they got a bitter taste of the dark side of capitalism, of what happens when investors believe the hype that stocks can only go up. We have all seen this play out many times before! The china stocks bear market has galvanised the West's perma-bears, many of whom have been proved wrong for years in calling the demise of the stocks bull market finally have some hope in the possibility of a double whammy hit as the China crash supplements the Greek crisis and so this surely must be the harbinger for a similar collapse in stock prices across western markets. The chinese market as measured by the Shanghai Composite Index (SSEC) peaked in Mid June at 5178 and then entered into a severe 3 week long downtrend with limit down moves and stocks freezing locking panicking investors into losing positions. The SSEC finally hit a bottom of sorts at 3373, down 35%, after heavy government intervention before bouncing for the last 2 days to 3877 (+15%). I will come back to what this means for China and western stock markets later in this article - but first the Greek COLLAPSE. Syriza's Cruel Hoax on the Greek People - KNOW THY SELF! Syriza presents bailout proposals worse than Greece rejected at the 5th July referendum. The Syriza game theory players 6 month long intensifying black mail of the euro-zone that culminated in the NO referendum to the previous bailout package from the 'evil Troika', who according to Syriza were financial terrorists hell bent on the destruction of Greece, to which end only Syriza were the Greek people's saviors who would prevail with no austerity over the evil Troika. However, as I have consistently pointed out for the whole of the past 6 months that ALL of it was a delusion! Not one of the Syriza game theory playing experts who kept raising the ante in their blackmail of the euro-zone, but of a crackpot Marxist Syriza that basically believed their own propaganda which first detached them from reality and then slowly 60% of the Greek people, where the truth was the near polar opposite of the picture that Syriza had been painting of victim hood, of the debt, deficit, bailout austerity and the evil Troika. NONE of which was true! The magnitude of the Syriza betrayal of the Greek people has now been exposed, who like wolves in sheep's clothing have led the Greek people unnecessary to literally to the economic slaughter house, as following the default on the IMF loan on 30th June, and then the smoke and mirrors 5th July referendum that first collapsed the Greek banking system and then soon afterwards the Greek economy. Now the Syriza government has apparently snapped out of its mass delusion, despite its ferocious propaganda having infected 60% of the Greek people. Syriza now has now presented a NEW bailout proposal to the Euro-zone in exchange for terms that are far more severe (to the tune of Euro 4billion of extra economic austerity per year) then the bailout that Syriza rejected less than 2 weeks ago ago! The magnitude of the Syriza deceit is further laid bare for amongst all of the talk of Greece being under an unsustainable debt burden that it is being forced to service. The truth as I have often voiced since Syriza were elected in January 2015 is the exact opposite! As the truth is one of a Greek state living far beyond its means that is RELIANT on SUBSIDY from the Euro-zone that has AVERAGED Euro 70 billion per year! Understand this Greece has made NO debt or interest repayments for the duration of the past 5 years, for ALL of the payments have been financed by the Troika. Instead Greece has enjoyed a NET inflow of approx Euro 20 billion per year. That's Euro 100 billion towards sustaining the corrupt Greek governments public expenditure voter bribes projects. Syriza promised a NO vote would result in the banks opening the following Tuesday (7th July) and that there already was a highly favourable agreement deal on the table. The reality is that Syriza has been forced to smell the coffee and wake up from its delusion that has prompted the Greek government to bend over backwards to present a proposal that at its core has a a request for a NEW BAILOUT / LOAN / DEBT of Euro 50 billion over the next 3 years. Where if the past 5 years are anything to go by then the actual amount that the Euro-zone tax payers without any democratic say will be forced to throw into the Greek black hole will likely in totality be TRIPLE the amount requested i.e. Euro 150 billion over the next 3 years of NEW DEBT that Greece seeks to BORROW from the Euro-zone which is BEFORE writing off ANY existing debt. a. Greece is BANKRUPT! So needs to default on its debts. b. Greece needs to DEVALUE / INFLATE so as to become productive, whilst deflating / economic collapse does NOT result in an increase competitiveness. Therefore the question is will the euro-zone throw another Euro 50-150 billion into the Greek black hole to kick the can three more years down the road, when we will be faced with a SIMILAR situation. Or will the euro-zone 'temporarily' allow Greece to exit the euro-zone to some extent, coupled with euro-zone aid. Given the total cave-in then probability now favours kicking the can down the road until the crisis blows up again, which it could do much sooner than most would expect given the political fallout of Syriza betraying everything it stands for. The deadline was supposed to be Midnight Sunday, however having delayed pressing the send button until the deadline past, the so called final deadline now appears to have been extended for the tenth time to Wednesday! So as to allow the Greek parliament to vote in favour of the severe Bailout conditions being presented by the EU Finance ministers, so more to follow Wednesday. Again my consistent view is that GREECE HAS NO CHOICE BUT TO EXIT THE EURO-ZONE, which it must do sooner or later. As I have often pointed out its not the debt that is the real problem for Greece but the structural deficit because we all know that the debt will never be repaid! Greece's debt is irrelevant because everyone knows that it will never be REPAID. ALL understand this, the IMF, EU, ECB, AND Syriza, but it does not suit Syriza's marxist agenda for Greece and therefore they continue to bang the drum of Greece suffering under an unbearable debt mountain that it is being forced to service when the truth for the duration of the past 5 years is that Greece has been a NET recipient of billions of euros per year from the Troika, i.e. that not only does this mean that Greece has not made a single debt or interest payment in ANY of the past 5 years, but also that the Troika has been financing Greek government spending to the tune of tens of billions per year and it is THIS which is the real issue that the Troika wants addressed i.e. for Greece to stop spending other peoples money and learn to live within its means. An IMF report as much as states the same that Greece will need a 20 year grace period before debt repayments AND be in receipt of Euro 50 billion for spending over the next 3 years which translates into debt that will never be repaid until inflation has wiped its value away and that the Euro-zone will subsidise Greece to the tune of as much as Euro 100 billion over the next 3 years. So the crisis is NOT about DEBT which Greece is NOT servicing but rather the DEFICIT which Syriza Greece expects the euro-zone to finance in perpetuity. Many if not most of the people of Greece are failing to understand this point that Greece is BEING SUBSIDISED by the rest of the Euro-zone rather than the mass delusion that the Greeks have convinced themselves of being victims of the euro-zone when instead the truth is that Greece has been a net recipient of tens of billions of Euros per year. As things stand most Greek people appear to have swallowed Syriza propaganda and thus are in a delusional state of 'we are the victims'. Greece is in the grips of mass delusion, madness that could yet result in Greece effectively committing suicide on Sunday. As game playing Syriza fools push Greece over the cliff and into the abyss, in the not too distant future many books will be written by academics of Greece, a text book example of what happens when a western nation goes MAD! Which needs serious study for if it can happen in Greece then so it can happen anywhere for we all have the same BRAINS! Susceptible to delusional constructs where another current example is the mass delusion of tens of thousands of muslims going off to the Islamic State Utopia when the reality is one of hell on earth! The other alternative is that Syriza instead of being fools have actually been working towards this outcome i.e. for Greece to leave the euro-zone so that they could then go on and create their marxist Utopia without euro-zone controls so as to curtail member state insane policies. After all what the opinion polls have clearly stated is that approx 70% of the Greek population fearing hyper-inflation do not want to leave the comforts of a stable currency. Hence an engineered crisis culminating in an referendum question that is designed to confuse the electorate into voting for a GREXIT. The bottom line is that Syriza is lying to the Greek public about having been making debt repayments for the past 5 years when in reality Greece has been on the receiving end of Euro 360 billion! AND that the euro-zone is LIEING to euro-zone tax payers because Greece will NEVER repay the Euro 360 billion. So whilst Greece is banging the drum of their democratic rights, what about the democratic rights of the other euro-zone tax payers, for no one asked them if they should each contribute to the Greek relatively laid back lifestyle in perpetuity because Greece is not experiencing the inflation that accompanies large deficit spending i.e. the UK prints debt and money to finance its deficit which causes inflation. And the UK debt is NEVER repaid because its value is being INFLATED away. So despite much huffing and puffing of economic pain over the past 5 years Greece in reality has just wasted time whilst its economy has shrunk by at least 30%, because the bailouts that have funded the Greek government spending. Thus successive Greek governments have only tinkered at the edges of structural reforms as Greece has yet to deal with what needs to be done to address its structural budget deficit by means of cutting public spending and more importantly COLLECTING taxes as Greece by far is the euro-zones worst nation when it comes to collecting taxes due i.e. 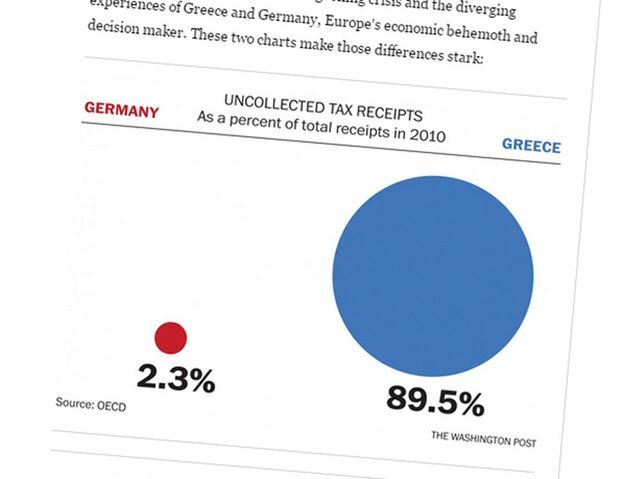 a recent study by the Washington Post suggests that 90% of the taxes due annually tend to remain uncollected, which compares against just 2% for Germany. Greeks are chronic tax evaders and therefore there needs to be a cultural change in Greece where ALL of the people of Greece need to look in the mirror and recognise that they are the reason for Greek crisis because they tend to TAKE far, far more from the state than ever PUTTING in and for the past 5 years that has been financed to the tune of Euro 360 billion by the euro-zone member states. WAKE UP GREECE AND KNOW THY SELF! The first thing to stand out from the SSEC price chart is that despite the 35% bear market, the Chinese stock market is still up about 15% on the year to date by ! Which highlights an important factor when considering the true state of a market rather than deferring to arbitrary rules such as a 20% drop means a market is in a bear market, well NO, not if the market rallied by 150% during the preceding 12 months, which is the case for China's textbook stocks bubble. Therefore for long-term investors in China the collapse is not that bad. However, don't jump the gun and start contemplating this as a buying opportunity! The truth about the recent crash is that China has given up about HALF the gain of the preceding 12 months! As an long-term investor such a move in the context of trend would not phase me which begs the question why the panic in china ? We'll obviously because they weren't actually investing but GAMBLING ON LEVERAGE! One has to remind oneself when staring at the price charts that this is NOT the same market as one normally trades in the West. For despite its size (market capitalisation) China is still a wild west frontier market, the mother of all bucket shops that operates within a totalitarian state! That literally decrees who is being allowed to trade out of their frozen stock positions whilst the mass of OVER 200 million retail investors remain locked into frozen positions as they desperately attempt to escape with some of their capital intact or worse for the many millions of those trading on margin that could magnify the losses sustained to as much as ten fold! i.e. at the extreme end of margin trading a 10% drop means a 100% loss ! That is a lot of psychological damage being inflicted on tens of millions of ruined chinese investors who are thus unlikely to want to come back to the market any time soon, even if they have any capital left after experiencing over leveraged mega wealth destruction. So investor psychology does not bode well for the stock market trend for the remainder of this year. Well, they did what one would expect any totalitarian state to do. They BANNED the mass of investors from selling their shares whilst the communist party vampires exited their holdings at bogus prices. It gets worse, the chinese government also ORDERED people to BUY shares and to top it all off they made billions available for stock buyers to leverage up on margin. THAT DOES NOT BODE WELL FOR MARKET TREND! And strongly implies the downside is NOT over! One would imagine the chinese stock bubble is trading at eye watering Nasdaq 2000esk levels north of P/E 100. Apparently its not quite that bad, instead forward P/E is about 60. Still pretty high when compared to the rest of the worlds major stock markets that are all sub 20, i.e. the US on 18 and the UK on 15. On face value this implies the chinese stocks could still potentially lose half their value, however most of these overvalued stocks are not actually in the SSEC index! Which in fact comes in at a P/E of just 30. Therefore most chinese stocks could still continue to crash whilst the downside for the SSEC is more limited. Which implies more pain for retail investors whilst the communist capitalists can claim that they have succeeded in halting china's stock market collapse. The chinese stock market support and resistance levels clearly illustrate where the SSEC index is likely to be buffeted pin pong style i.e. the current bounce could continue to just over 4,000. However that would be just a correction ahead of another lurch lower as the SSEC clearly targets a break of 3,000. The only question market is how low will the SSEC go? As the next stop would be 2,500, and then the SSEC would enter into a far more stable long-term range of 2,000 to 2,500. So in a worst case scenario China could tumble back into the previous long-term range of 2,000 to 2,500. More probable is a spike to below 3,000 and then attempts to build a base between 3,000 and 3,500. MACD - Is extremely oversold, so its no wonder that the market is bouncing, and could continue doing so for some days, probably for the whole of this week. And last but not least is my favourite snake oil of all, EWT. The EWT pattern appears pretty straight forward, the peak was a 5th and thus the subsequent correction should form an ABC, where A is complete and we are in the B wave corrective rally which should be followed by a C wave decline on par with the A wave 35% decline which thus implies that the SSEC targets a spike down to 2,500. So will the western stock markets such as the US and UK follow the Chinese stock market off the edge of a cliff as there is much worse to come for China stocks? We'll the starting point is to look at the degree of deviation from my existing longstanding forecast for the Dow for 2015 that acts as a road map against which to measure strength and weakness and thus adjust positions accordingly and undertake further in-depth analysis if necessary. My most recent look at the stock market (Dow 17,654) reaffirmed my expectations for a continuation of the stocks bull market to new all time highs following an imminent low at around Dow 17,500. Subsequently the Dow did trend lower to 17,500 following which has been attempting to make a base in the face of China collapse and GrExit that has seen the Dow rally by 300 points to 17,760 which is virtually exactly where the trend forecast of over 5 months ago stated where the Dow would be by now. 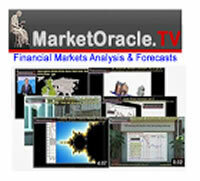 Therefore without any deviation from the forecast trend, then at this time I do not see any reason to conduct an more in-depth analysis, as despite China's bear market likely to resume in the near future, instead the Western markets such as the Dow could march in the OPPOSITE direction to that which the consensus would expect the stock markets to do. Wow, that is definitely going to leave many analysts scratching their heads as they watch US stocks soar and Chinese stocks plunge, who with the benefit of hindsight will find plenty of reasons why as they look back in their rear view mirrors several months from now writing reams and reams of highly convincing gobbledygook or to vegetate in a state of denial as they wait for the crash to come. Also subscribe to our Youtube channel for notification of video releases in our special project on the "The Illusion of Democracy and Freedom", that seeks to answer questions such as "Did God Create the Universe?"